A high-quality Jakkolo for the whole family. Game board made of beech wood - Size: 200 x 41 x 4.5 cm with a drawer to keep the fire bricks. Includes 30 wooden game pieces and game instructions. Weight: 6.5 kg. The shedding bar, the wood of the litter and the interior walls of the slots are made of beech wood. 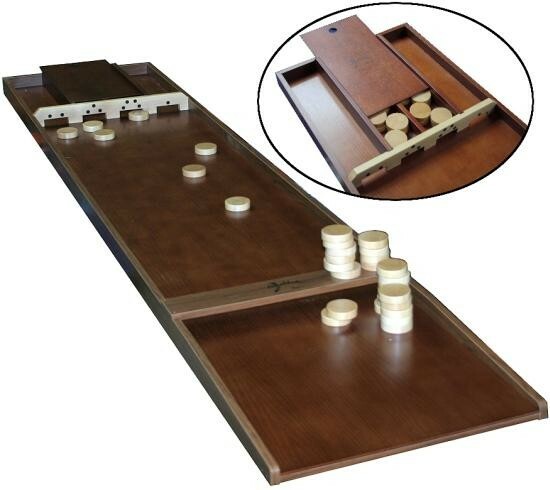 Supplied with 30 ground plan, lacquered beech game disks are included. The surface of the board consists of wood veneer. The gangs and the board are made of durable and non twisting chipboard (MDF) and the bands are covered with durable plastic laminate. A game board, must be shot on the round wooden disks into goals. A game for young and old, and suitable for youth. Hold in a tournament with friends. Is already in many youth organizations, schools, churches, social institutions, etc. and discriminating individuals. You can lay it on a table and can be played sitting down. The device is safe delivered in a box.